"Our patience is running out very quickly... We will do whatever it takes." Those were the words of Lamoin Werlein-Jaen, UNITE HERE Local 2 Secretary-Treasurer, speaking to hotel workers rallied in front of the Palace Hotel last Thursday. Not long afterwards, dozens of hotel workers and supporters were carted away by police after they sat down and blocked the doors to the historic hotel. Local 2 has long been one of the key players in San Francisco's labor movement. The union's trials, travails and triumphs over the years have reflected both the state of labor and the state of the left in US politics. The local is now led by Mike Casey, first elected President in 1994. Casey has overseen a period of organizational stability and consolidation and, in recent years, a significant growth in membership following years of decline. He has run the local longer than anyone else since the infamous business-union administration of Joe Belardi was deposed in 1978. Belardi had long ruled the roost among San Francisco hotel and restaurant workers. Belardi came out of the cooks union, back when there were separate locals for cooks, bartenders, waiters, waitresses, dishwashers and maids. The old craft unions were merged in 1975 to create Local 2. The merger was a controversial process that put Belardi in control of the new local, along with a rogue's gallery of (mostly) labor hacks. The merger was orchestrated by then-international union President Ed Hanley, whose installation many believe was itself orchestrated by the Chicago mob. The merger brought together the disparate crafts into one union that, whatever Hanley and Belardi's intentions, also threw together many different shop-floor activists and rank-and-file dissidents from around the city. In addition, it provided an easy entry point for various left organizations looking to do labor organizing in the post-1960s era. It was a heady mix, and the pot, boiling hot, boiled over. Belardi was unceremoniously dumped in the first union election under the merged local. But neither side threw in the towel. What followed was a tumultuous period of both reform and reaction, including a trusteeship imposed by Hanley but eventually overturned by court order, several bitter union elections, and years of raucous union meetings and vigorous agitation from the ranks. This is the context in which the 1980 hotel strike and the 1984 restaurant strike took place. These were the last big, city-wide strike actions by the union, prior to the strike and lockout at the Multi-Employer Group (MEG) hotels in 2004. In 1980, hotel workers went out on the first city-wide hotel strike since the 1940s. The union was ill-prepared for this battle, which put over 6,000 hotel workers on the street at every major hotel in town. But the international union, which was calling the shots at this point, found itself backed into a corner -- on the one hand by a still-growing rank-and-file workers movement eager to confront decades of economic injustice, racism and neglect, and, on the other hand, by an avaricious set of hotel bosses emboldened by the growing political reaction of the times. The 1980 hotel strike produced numerous confrontations -- and not of the scripted, pre-planned type organized by the media-savvy -- by angry workers not always willing to contain their rage within the normal prescribed boundaries. The strike rocked the city for a month. The Hilton shut down. The hotel bosses lost millions. But the cards were stacked against us. Feinstein was mayor, and openly recruited conventioneers and tourists to come to town as strikebreakers. Still, the strike only ended when the international union took the negotiations out of the hands of the elected rank-and-file negotiating committee, and cut a deal with the bosses at a secret meeting in Los Angeles. The settlement was controversial, to say the least. Any discussion of the 1980 strike and its aftermath can still get the bile flowing among those of us still around, of which there are quite a few. The 1980 hotel strike was a sharp break with the business-union days of the old Belardi administration. But the settlement was a mixed bag, at best, and was closely followed by a consolidation of reactionary politics in the nation with the election of Ronald Reagan in November. Still, the pot continued to boil. Four years later, in 1984, it was the turn of restaurant workers. Back in those days Local 2 really was the Hotel and RESTAURANT union. Nearly every major restaurant in town was at least nominally union, and there were thousands of unionized restaurant workers. But the 1984 restaurant strike was a disaster. Accounts certainly vary, especially of responsibility for the defeat, but defeat it unquestionably was -- and the beginning of the end of any serious presence by the union in San Francisco restaurants. Today, unionized restaurant workers, outside of big hotel restaurants, number in the hundreds, if that. This has long been one of the major liabilities for both Local 2 and the labor movement in this historically union town. In 1985, in the aftermath of the restaurant strike debacle, Sherry Chiesa was elected President with the backing of the international union. Chiesa ran the show for several years. Her administration stabilized the union and calmed the ranks during the hard times of the Reagan and Bush administrations. But this was clearly a period of retreat for Local 2, for the international union, and for the labor movement as a whole. In addition to the loss of many restaurant contracts, several new hotels were built and opened without signing union contracts, something unheard of in San Francisco for decades. In 1994, Chiesa stepped down as Local 2 President (and up into the international union hierarchy), and the reins passed to Casey. Chiesa is now an international union vice-president. Casey inherited a stabilized union, but one seriously in decline, and with deep structural problems. But the political winds were blowing leftwards during the early years of the Clinton administration, and Casey had the smarts to unfurl the sails and ride the winds. Successful organizing drives continued and bore fruit under his watch at the Parc 55 and later at the Marriott. The union won a hard-fought strike at the Mark Hopkins in 1994. Casey negotiated well with the powers-that-be in city hall, and won important legislative victories that made it much more difficult for the big hotel bosses to build non-union hotels. The international union went through a major transformation in the early days of Casey's administration. In 1995, the US Justice Department and the international negotiated a "consent decree" that placed the international under a federal "monitorship" for three years. The purported aim of this agreement was to root out corruption and racketeering within the international and many of its locals. At the end of the monitorship, in 1998, Hanley stepped down as President, and was succeeded by John Wilhelm. There followed a period of less formal Justice Department supervision. Hanley died not long afterwards, in January, 2000, in a car accident on a country road near one of his vacation homes in Wisconsin. The Justice Department ended its supervision of the international a year later. During all the post-Belardi (and now post-Hanley) period, the key to Local 2's survival and stabilization was an effort by all the key players within the local to build a real base of support among the maids. During the Belardi administration, the maids were for all practical purposes viewed merely as the ladies auxiliary. All the important power brokers came from the better-off crafts -- cooks, bartenders, waiters, and some waitresses. Back in those days, these crafts were also much more white and much less immigrant than today. But anybody looking at the long lines of maids lined up to vote out Belardi in 1978 could see that any ambitious or potential union officials better do right by these women. During the 1980 hotel strike, the power of the maids was on display for the whole city to see, as it was clearly the maids who really held the picket lines together. The process of elevating the interests of the maids to front-rank status was also accelerated by the subsequent loss of so many restaurant contracts, and, consequently, of so many restaurant workers. In many ways, it was the process of consolidation of the crafts, mandated by Hanley, that brought on his own demise and of his allies in the union. Where a Belardi could call the shots from his perch in the cooks union prior to the merger that created Local 2, throwing all of the various crafts together meant not only throwing together all of Belardi's opponents, but also brought the long-ignored maids to the fore. The process of consolidation within both the local and the international has continued even in the post-Hanley period. A movement under nearly-constant attack, as the labor movement has been for decades, is bound to seek consolidation as one method of protection. In early 2004, Local 2 took over the nearly-moribund San Mateo hotel and restaurant union local. 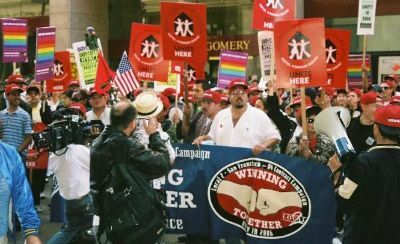 Then, in July -- just a month before Local 2 began the 2004 strike that led to the two-month lockout -- the international union, the Hotel Employees and Restaurant Employees (HERE), merged with UNITE (formerly the Union of Needletrades, Industrial and Textile Employees). Together, we are now known as UNITE HERE. While this was a merger of two unions from very different industries, what clearly unites us is the fact that the workers in both industries are overwhelmingly people of color and largely immigrants. It is hard to imagine the old Hanley forces even considering such a move -- although it is possible that Hanley and his less savory friends might not have been averse to tapping into the significant pot of money that UNITE brought to the merger. 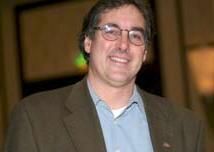 UNITE's leader, Bruce Raynor, was named General President of the merged UNITE HERE. John Wilhelm, the former head of HERE, was named President of the new union's Hospitality Industry division. The combined UNITE HERE currently represents more than 450,000 active members and, significantly, more than 400,000 retirees. The process of consolidation has continued with the efforts of the new UNITE HERE to align the expiration of hotel contracts around the country. This has been a key factor in the current San Francisco hotel contract struggle, although the practical results of this effort are yet to be determined. Its success or failure will weigh heavily on the future of hotel workers around the country. Somewhat contrary to the ongoing process of consolidation, last year UNITE HERE joined the group of international unions that split off from the AFL-CIO and formed the new Change to Win labor federation. The new federation currently represents six million members. UNITE HERE is one of the key players in the new federation. Much has been said about the emergence of the new federation, and of the motivations of the union officials involved. But, however this process is to be understood, the new federation needs to prove its worth with significant victories. So far, major victories have been few and far between. In this context, the results of the current UNITE HERE nationwide hotel contract negotiations will play a significant role as a bellwether for the new federation, as well as for the newly-merged UNITE HERE. The stakes are high for the labor movement, as well as for hotel workers.